Look at it. Just…look at it. Did I resize this too big? CAN it be too big? This is my favorite V.C. Andrews stepback picture. I mean, it has to be. It’s incredible. Like most of the Dollanganger stepbacks, it’s pretty straightforward, cast-wise: Carrie, Cathy, Christopher, with Olivia (!) in front. Like the later Landry stepbacks, it shows an actual scene from the novel, albeit an altered one, given who is there. SPOILER ALERT: It’s only Cathy who faces Olivia in this state, Chris isn’t there and Carrie is dead by then, but I think it works thematically, since this is the revenge book. And those are some folks out for revenge. Look at their faces! Look at their eyes. George Sanders should be building a brick wall in his mind just looking at them. So, person by person, starting with poor little Carrie. 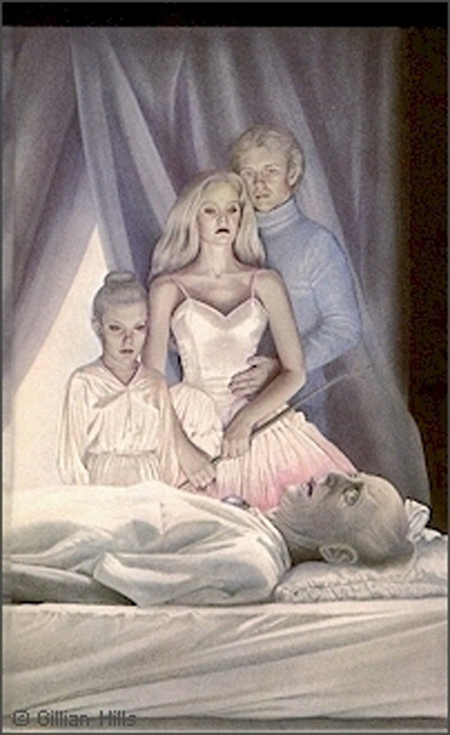 Interestingly, I’d always wondered why the artist had drawn Carrie so young on this cover, even though she’s no longer with us by the time this scene happens she’d been an adult when she died. It wasn’t until recently (sometimes my mind gets caught up in other things, y’all, like embroidery or pizza or True Detective) that I realized that, sadly, Carrie probably looked like this AS an adult, though maybe a bit too short. She’s described as really short (though she wears like five-inch heels all the time to make up for it, get it Carrie), but I do think that this depiction would be a touch too far. I mean, Cathy’s probably what, like 5’5? Ballerinas are short, right? So if that’s the case, Carrie would be…hella short. (Look, Swamp Thing does the math and he’s not here right now) I think Cathy mentions Carrie’s actual height once or twice, I’ll make sure to get the right stats out to y’all then. The point is: I think maybe Carrie is a little too short on the cover here, unless she’s meant to still be more or less a child/teen. Her head does seem big (that’s so mean but it’s a LITERAL CHARACTER DETAIL), but her face is almost elven, which I enjoy. Makes her seem mischievous, in the best fairy “I’m gonna steal your babies for fun!” kind of way. She’s wearing full satin, which I can only approve of. I hope it’s a jumpsuit. Moving on to our heroine, Cathy is wearing a pink satin ballet get-up, which seems only right. I wish this was all she ever wore, like Miss Havisham in a tutu, but unfortunately it’s not. I can only dream. Like Carrie, she’s got some great vengeance eyes, but her frown is getting to me, it just doesn’t seem to work? Carrie seems so malevolent but Cathy just looks…grumpy? Disapproving? Carrie’s like this little sprite all “LET’S SET HER HAIR ON FIRE! FOR LAUGHS!” whilst Cathy just doesn’t like that hair bow. I don’t know, I feel like she should look colder, maybe, since they’re giving the fire to Carrie. EDIT: I’ve since compared/contrasted this image (which I found online) to my paperback’s cover and Cathy doesn’t look quite as frowny on my copy’s cover. So maybe that’s just a scan issue. Coldness achieved! She’s holding a switch, which is important for this scene in the book, and her hair is pretty great, so while she’s not the worst part of this cover for me, I just wish her frown didn’t look so haughty. Plus, pink satin? Really? I don’t know, it just seems weird. It’s not like she has some aversion to pink that the artist ignored (don’t you hate when that happens? Like, a character has a whole thing about blue and then they draw ’em in a blue coat or something? ), she wears a pink dress to her birthday party and I’m sure there are numerous pink costumes, I just feel like white is more associated with her? At least in my mind? Maybe I’m just projecting my fondness for “Nights in White Satin”? Carrie’s favorite colors are already ignored here, but the color palette doesn’t work for them. Again though: not my favorite Cathy, but not the worst part. The Worst Part: Christopher “Powder Blue Turtleneck” Dollanganger. Oh wait, I mean Christopher “Powder Blue All The Way Down” Dollanganger. 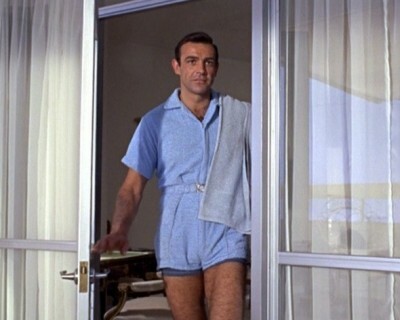 For the love of… You know the one time a powder blue ensemble has worked? This is on Chris’ Amazon wish list. Actually, that’s my head canon now. Chris is just really, really into Dr. No. James Bond aside, Chris is just kinda here on this cover. He’s touchy-feely with Cathy, natch, and he’s sort of gazing at Olivia in a “Oh huh. Look at that.” way and his hair is ridiculous. So I think we can all agree that Chris is fairly meh right now. Which leaves us with! Olivia. Oh man. Ohhhhhh man. This cover pulls no punches when it comes to Olivia, that’s for sure. (None of them do, not even the cover of her own prequel, which is truly cold. Even Lillian Cutler got to look pretty on the cover of her prequel) Olivia is a non-entity for most of this book. Cathy’s focus is on Corrine and the Grandmother is an afterthought, someone who will have to suffer once her daughter’s been exposed, which underlines how very much the main villain Corrine really is, despite Olivia seemingly calling the shots in FitA. By the scene in the novel shown here, Olivia’s had several (?) strokes and can no longer walk or speak. I won’t go too into the scene itself, since there’s a LOT going on in it, but this depiction of Olivia is pretty straight on: sickly, alone, with her remaining hair in a topknot with a bow. I’m not entirely sure where they’re supposed to be, since those don’t look like bed curtains and the effect is rather that of Olivia on a bed by a window, with the 3 Ds just popping up between her and the window, but whatever, it’s dramatic. I am 100% not okay with how Olivia is staring! right! at! us! You didn’t notice that till I mentioned it, did you? Now you can’t stop. Coming up! A Greyhound bus ride from hell, the introduction of Creepy Paul, and probably also the introduction of Creepy Julian (I forget how far he comes into it)! Why so many creeps, is the question. I think Cathy’s expression comes from her aversion to *spoiler* “released” bladders. I mean, sure she ends up banging pretty much every adult male she encounters, but there are reasonable limits to everything. That whole scene…it’s something all right. I always thought they looked like aliens and this would be more suitable for a sci-fi book. AND WHY IS SHE LOOKING AT ME? 1. Your comment was in *spam*, which what? 2. I can see it. There was a lot of alien-ness on ’70s/’80s horror covers, everything was weird and odd-eyed. Or skeletons, but that’s something else entirely. I’m so excited! And this is probably one of my favorite covers (for some reason I really liked Lillian Cutler’s), but I can’t get over the goofiness of Cathy’s mouth. This cover is just the right amount of “What wait? !” it’s incredible. I’m pretty sure Carrie’s height is stated as 4’6 at some point. If Cathy were 5’5 she’d be on the tall side. 5’4 is average height for women (dorky knowledge holder here). For ballet dancers or in general? Hmm. So that would make Chris maaaaybe 5’9? I’m 5’10 and I feel like I tower over 5’4 people and he doesn’t seem tall enough. These darn Dollangangers! You mention that for Carrie in the stepback that her favorite colors are ignored. Maybe in her clothing, yes. But her earrings (which you can’t see in the scan but are clearly visible in the book’s stepback) are purple and red. 🙂 I have always thought it was a nice touch by the artist.
! Thanks for telling me, I’ll have to check my book when I get home. That is a great touch, you’re right. (Squeals) I cannot wait to read your recap of this book! I always thought Carrie had quite the evil expression on her face as she stares down at the Grandmother. It does not help that I thought her eyes looked red. Maybe I had an oddly printed copy. Check this out, by the by! Publicity stills from the new movie! I totally did NOT picture Julian looking like that in my head. Her eyes do look red! Cripes, Carrie! I so did not even know these Lifetime movies were even a thing. I’m turning back on my cable just for this…and eating powered donuts to celebrate while watching.